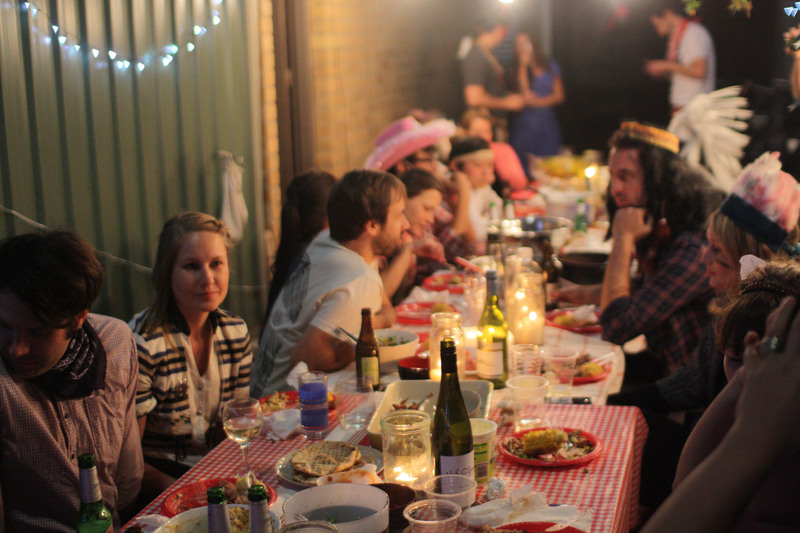 I’ve wanted to try dip dyeing feathers for a while and a friend’s recent “Cowboys & Indians” themed dinner provided the perfect opportunity! 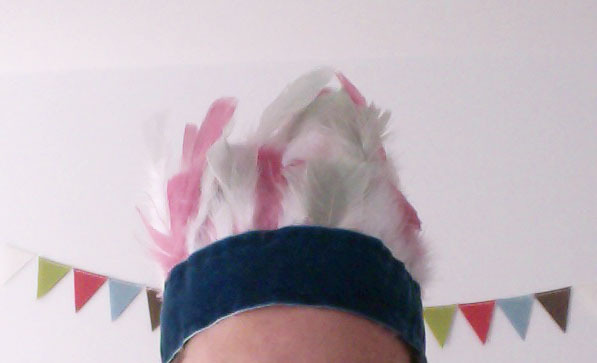 I decided to make myself a not-so-traditional feather headpiece using feathers dip-dyed in pastel pink and green. Sort your feathers. If you’re dying multiple colours work out how many you want in each colour and make a pile of each. 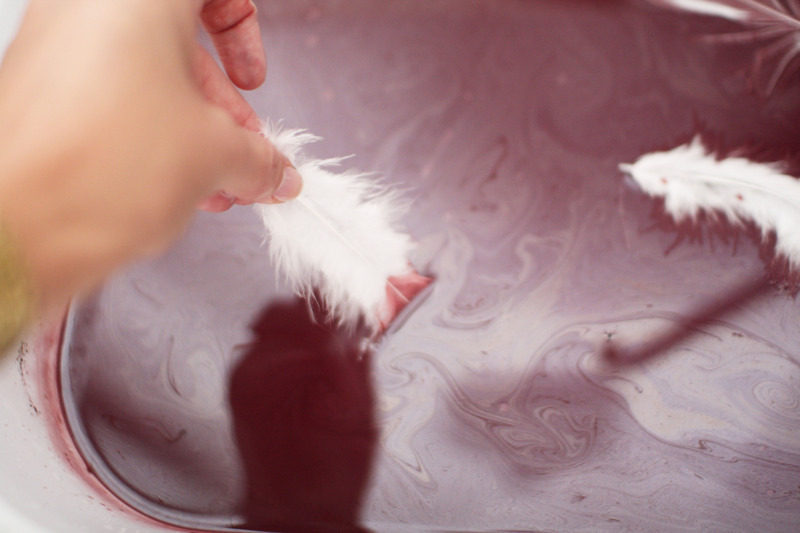 Using rubber gloves, mix up the dye bath for your first colour. 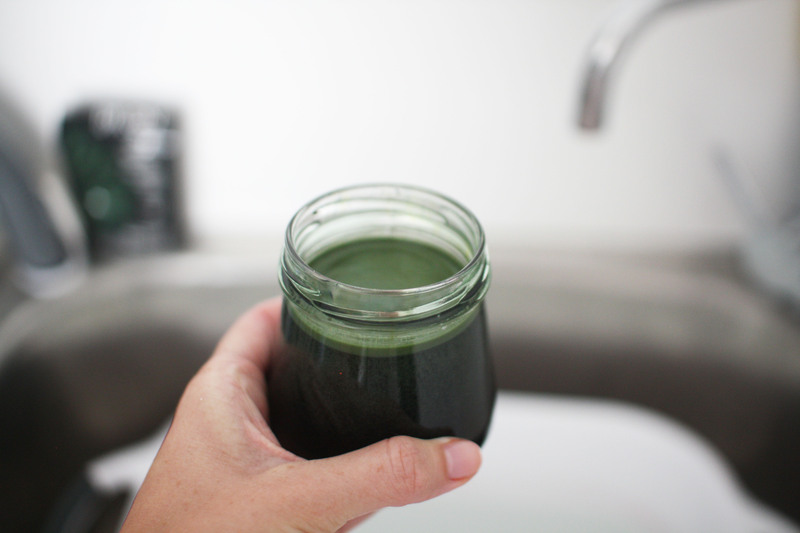 In an old jar, dissolve your dye in 500ml warm water. Fill a bucket with about 6 litres of warm water and stir in 5 tablespoons of salt. Add the liquid dye and stir well. Dip your feathers one at a time. How far you dip them is up to you, but dipping around 1/3 – 1/2 generally looks best. I used turkey feathers, which have a different texture at the tip to further down, where they get fluffier. The tip took to the dye better than the fluffy part, so with some of my feathers I chose to just dip the tip. I also fully immersed a few to get a bit of a mix. 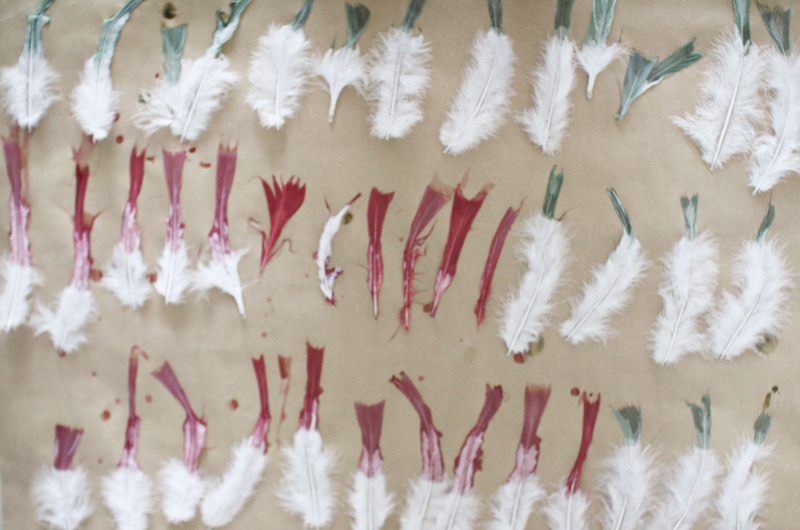 How well the colour takes will depend on the type of feathers you’re using and the strength of your dye bath. I mixed my dye bath at around half-strength to get these pastel colours (i.e. I used half a 50g packet of dye per 6 litres of water). 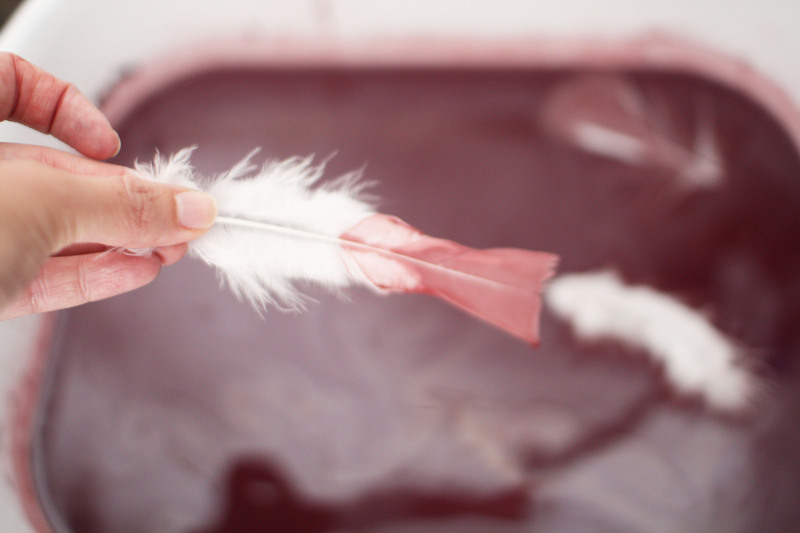 Keep in mind that your feathers probably won’t absorb the dye to the same extent as fabric, so the shade will be lighter than you might normally expect from the same amount of dye. Also, your feathers will look a much darker shade when wet than dry. 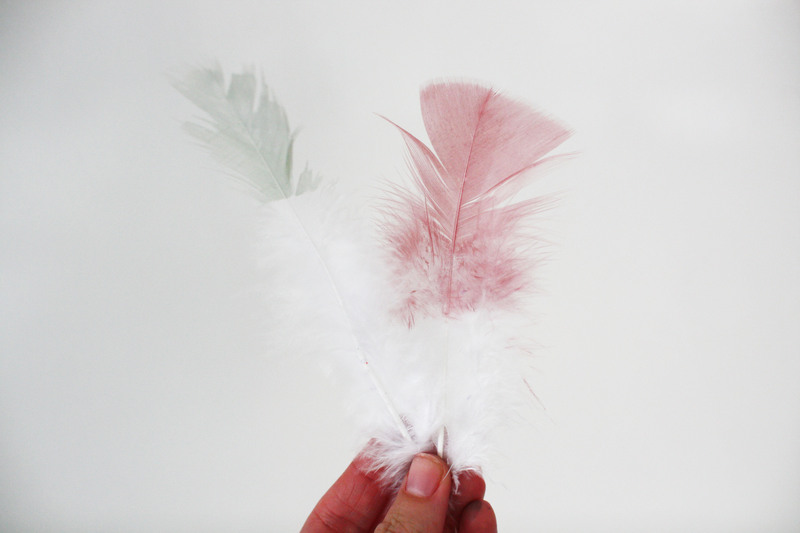 After dipping each feather, lay it down flat on your piece of scrap paper to dry. Make sure none of the feathers touch and that you keep the fingers that are holding onto the dry ends of the feathers clean. Once you’re finished with your first colour, dispose of the remaining dye (or use it to dye something else while you’re at it! 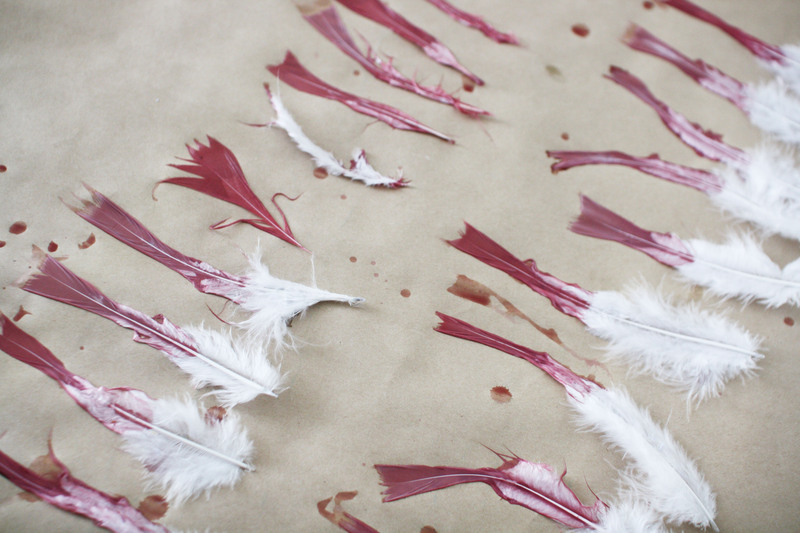 ), and repeat the process with a second colour and another batch of feathers. 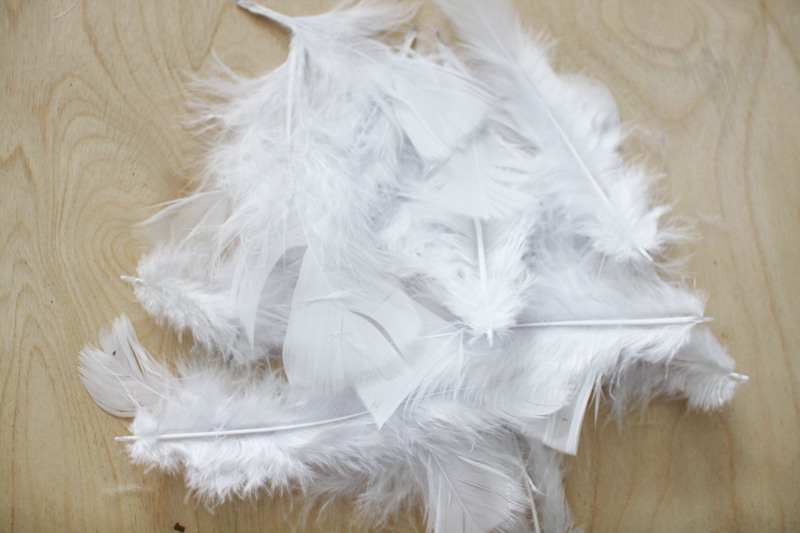 Leave the feathers to dry on the paper for around an hour, or until they are 80% dry. They will probably still look pretty scraggly at this stage, but don’t worry, you’re about to fluff them up! 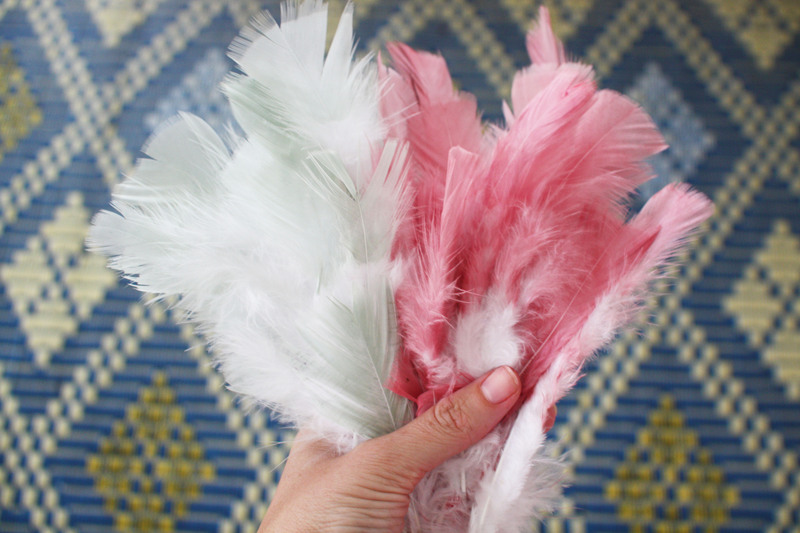 Holding a few feathers at a time in one hand, use the other to blow them dry with your hairdryer. This will bring them back to their former fluffy glory! 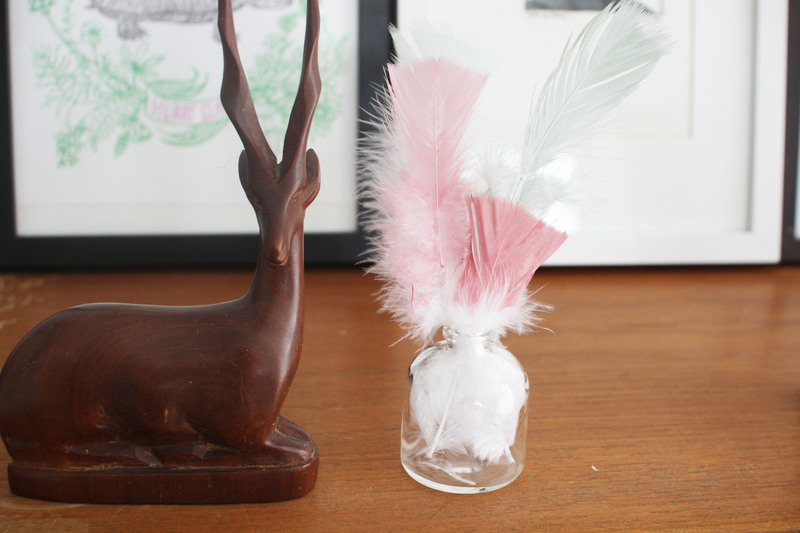 Once your feathers are all dry, you can display them in bottles, make a sweet garland (just tie some string to the end of each one, spacing them a few centimetres apart), use them in gift-wrapping, or stitch them to a wide ribbon to make a headpiece like I did! 12 Mar	This entry was published on March 12, 2013 at 9:44 am. It’s filed under make and tagged decoration, dip-dye, feathers, make. Bookmark the permalink. Follow any comments here with the RSS feed for this post.